Pittsburgh 360: Mid-Atlantic Emmy Awards aired on Oct 30, 2014. In this episode, Michael Bartley sits down with Dr. Linda Lane, the new superintendent of Pittsburgh Public schools to learn her priorities and visions for the district. Also, viewers meet local jazz musician Lou Schreiber. Blind since birth, this 63 year old Bellevue musical genius has played with some of the greatest musicians who've ever lived. Also, in another installment of his "Behind the Line" series, Chris Fennimore profiles Kevin Sousa, owner of the newly opened and critically acclaimed Salt of the Earth restaurant in Garfield. In this episode, Michael Bartley introduces viewers to a local teen who turned to weight loss surgery to shed 140 pounds and change his life. Also, viewers will meet a local metalsmith who is making jewelry inspired by the local dialect known as "Pittsburghese." Plus, the story of two Carnegie Mellon alumni who started Bossa Nova Robotics where they combine their love of music and science to produce amazing robotic toys. 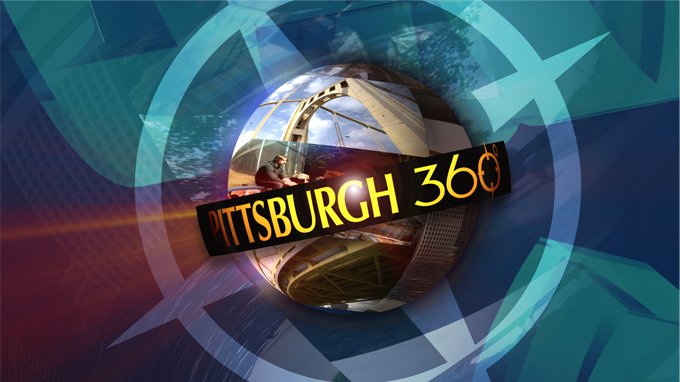 This premiere episode of Pittsburgh360 features the Vatican Splendors exhibit at the Heinz History Center, and the Pittsburgh Symphony Orchestra's support of school music programs in the Pittsburgh region. In this episode, Tonia Caruso visits Drunken Angels, the newly opened clothing, jewelry and art storeof a local woman who spent part of the 1990's sleeping under a bridge. Also, in a new series "Behind the Line," Chris Fennimore profiles another one of Pittsburgh's great chefs, Andrew Hebson at the Sonoma Grille. And Michael Bartley introduces viewers to a Fox Chapel woman who creates holiday wreaths from Christmas tree ornaments. In this episode of Pittsburgh 360, Tonia Caruso reports on the popularplay and film,"The Chief." Also,Michael Bartley previews a movie about Italian immigrants living in Pittsburgh. Viewers will also travel to the Stockdale Fire Hall to see why its the location of a reunion in the name of pop music.